My Algebra 2 kids are working with rational expressions. I'm pretty sure it's my least favorite topic to teach in the world. 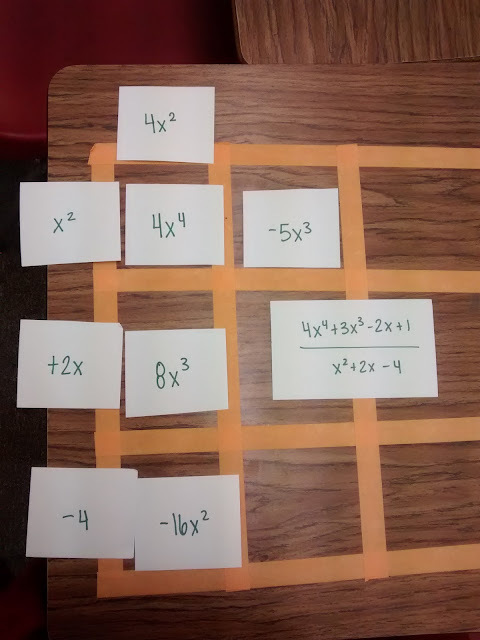 It's tedious, and it's a nightmare for my students who haven't fully mastered factoring. My students have traditionally struggled with remembering that they can only cancel factors and not terms. I started fighting against this a couple of years ago by telling my students that every time they canceled out terms, a kitten died. I originally found this on Math Curmudgeon. There's a whole set of pictures of different animals dying for various common math mistakes. You should definitely follow the link! 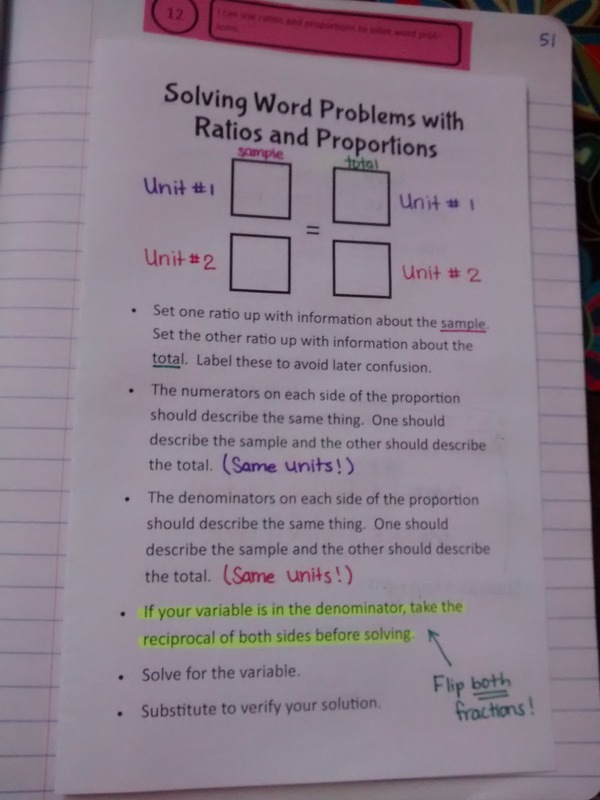 I've blogged about using this in a lesson before here. This year, to build anticipation and provoke curiosity, I hung this poster up in my classroom a couple of weeks before our unit on rationals. 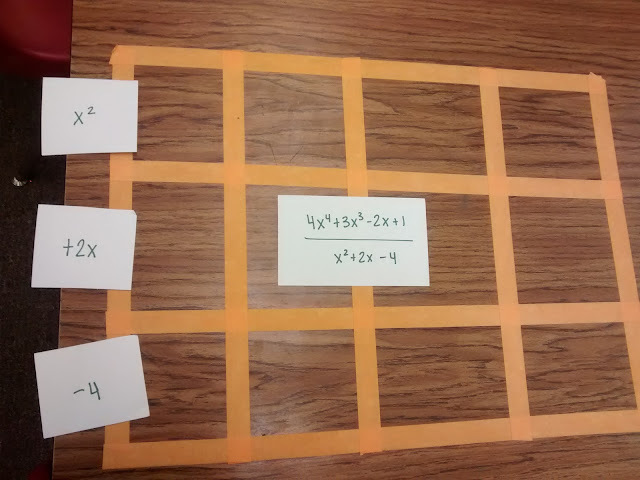 Of course, my Algebra 1 kiddos ended up asking the most questions about it, and I had to explain that it was an Algebra 2 thing. They hate when I tell them that something is for another class. 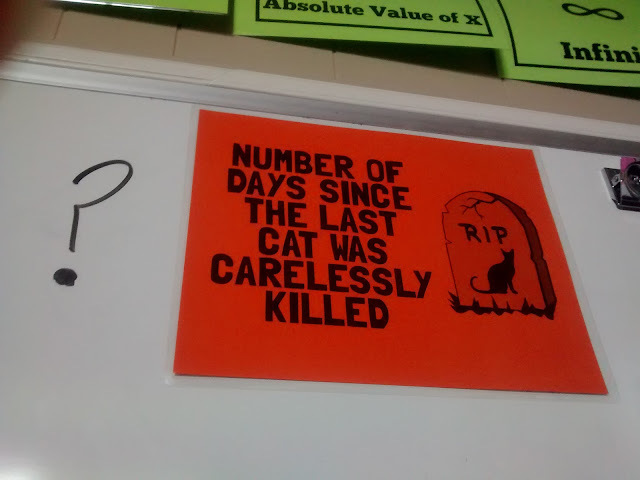 I make a really big deal whenever someone kills a cat and I have to change the count. 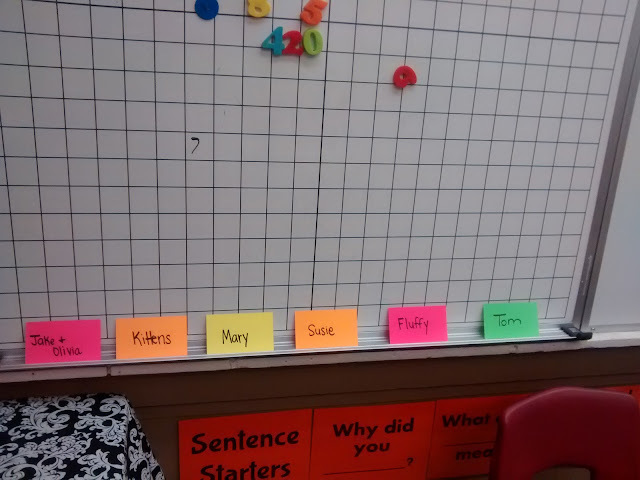 And, the kids are always watching to make sure I accurately update the count each day. Here's the file if you want to play along. And, for the record, two cat posts in a row is just a coincidence. Promise. I teach three periods of Algebra 1, and these classes have really been struggling. So, I've been trying something new. I'm trying to spend one period per concept on notes and practice problems. I want to give my students exposure to different ways questions can be posed and show them how to correctly set up their problems. Then, instead of quizzing on the next day, I've been giving them some sort of activity to do in a group for half of the period before the quiz. For review type topics, it's been working well. Now that we're getting ready to delve into functions, some ideas will take much more than one lesson to flesh out! I was shocked that none of the kids called me out on writing all of the questions about cats. I did overhear several conversations about the craziness of some of the scenarios. My students totally think Jake should dump Olivia because she is C.R.A.Z.Y. And, they can't imagine kittens that don't like being held. 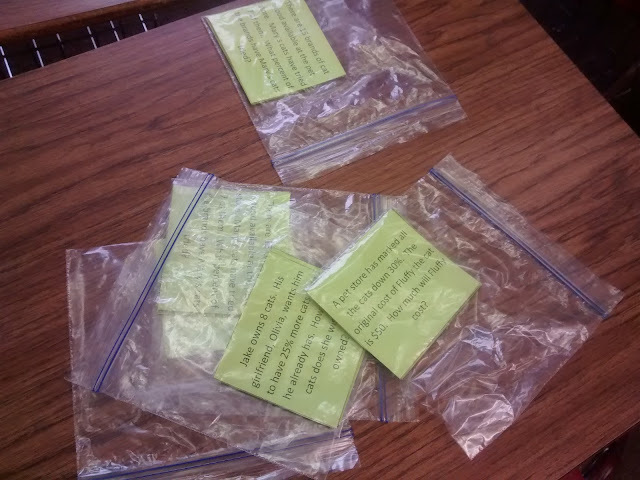 I put students in groups and gave each group a bag of cards. I seriously do not know what I would do as a teacher without ziplock bags. I use them for everything! 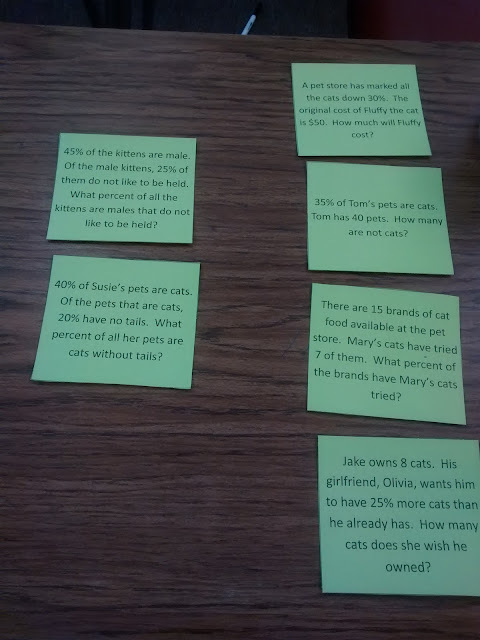 First, I had my students sort the cards in their group by how many percentages they were dealing with. I gave them four problems involving one percentage and two problems involving two percentages. 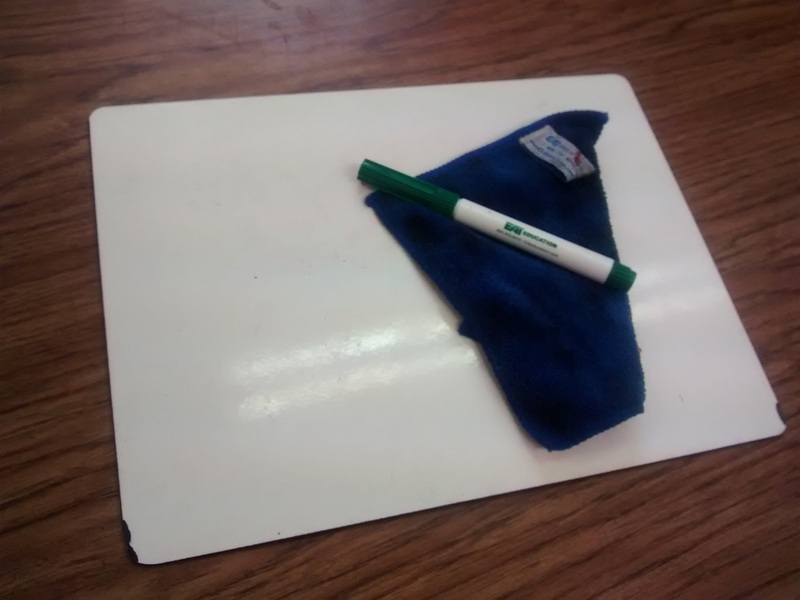 Each group also got one and only one dry erase board. 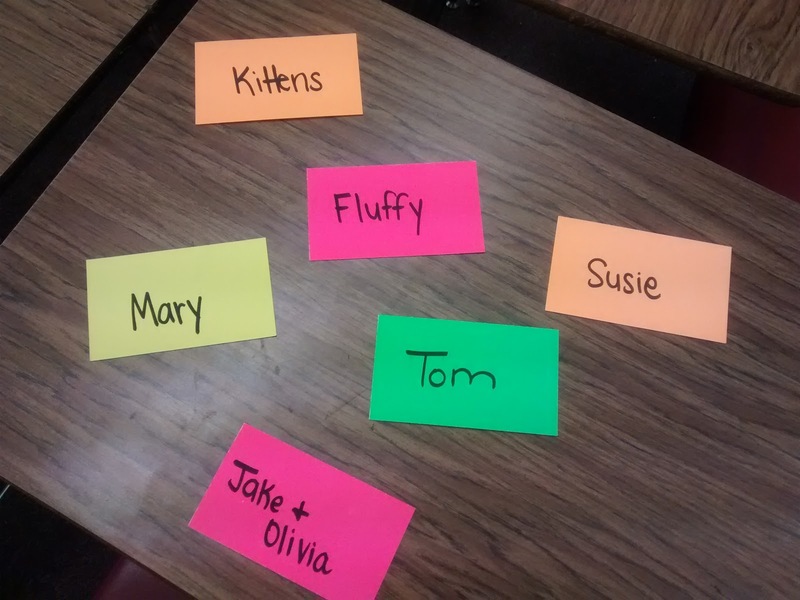 For each problem, the group had to pick a person to be in charge of writing. Only that student could write on that problem. With each new problem, the person writing had to change. I am doing to to try to avoid my students' tendency to let one student in the group do all the work. 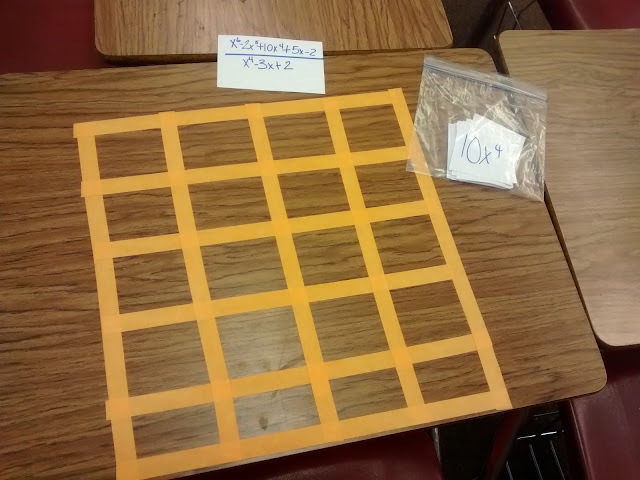 And, I believe that it promotes communication skills and math talk in my groups. After the group solved the problem and arrived at the solution, they had to send one student to the solution center to check. I wrote out the solutions on colored index cards that I got from Dollar Tree this summer. 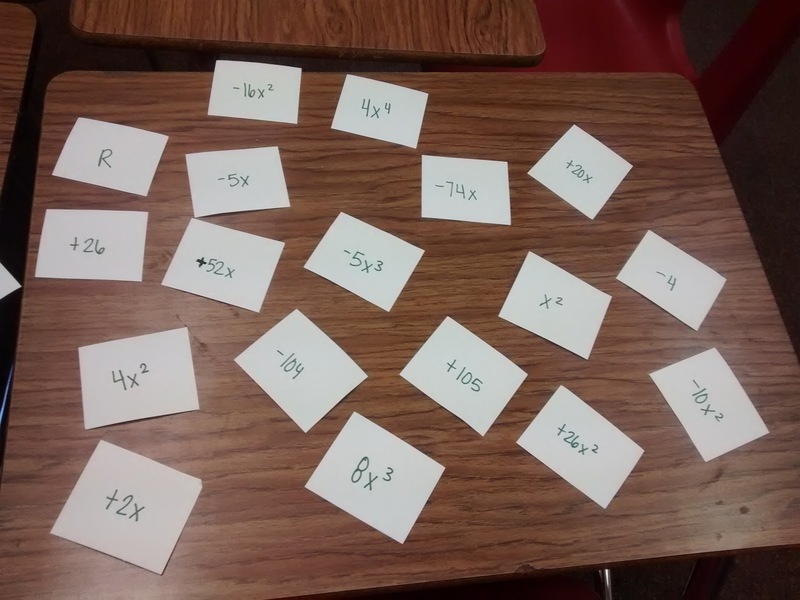 On the unlined side of the cards, I wrote a keyword from the different story problems. On the lined side of the cards, I wrote the solution. 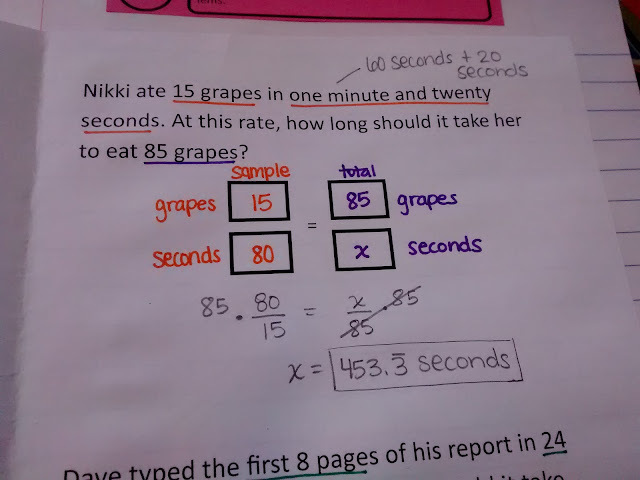 Each group had to send a person to check the answer with the caveat that the person checking the answer could not be the same person who did the writing for that problem. This student would go back to the group and tell them that they got the answer right and could move on to the next problem or that they got the answer wrong. 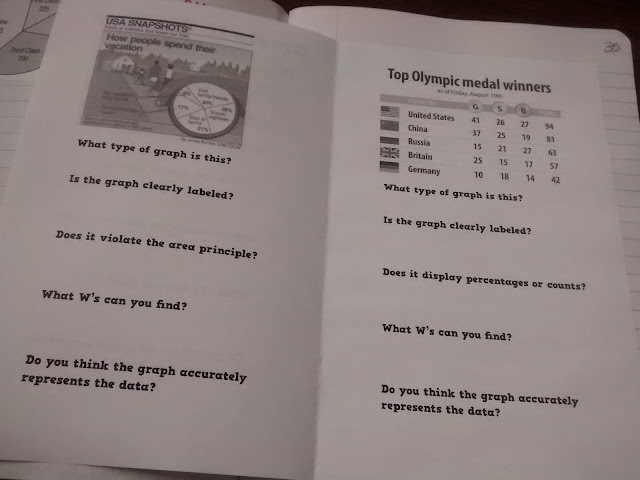 If they got the answer wrong, they were allowed to tell their group what the correct answer was. Then, the group had to work together to figure out where they went wrong. 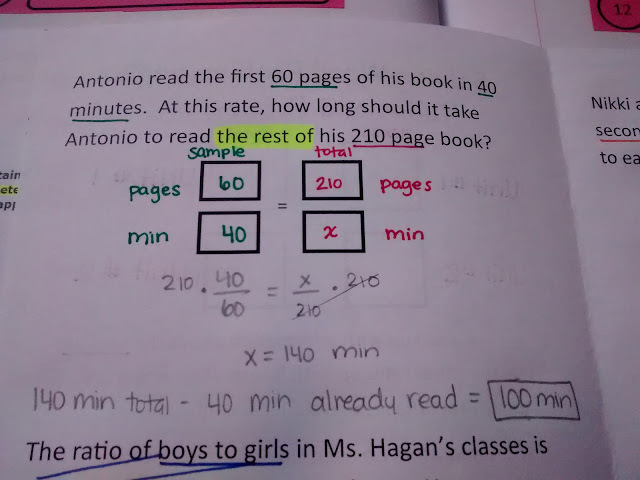 More often than not, the students had worked the problem correctly. They just hadn't paid attention to exactly what the question was asking of them. They would solve for how many were something instead of how many were not something. 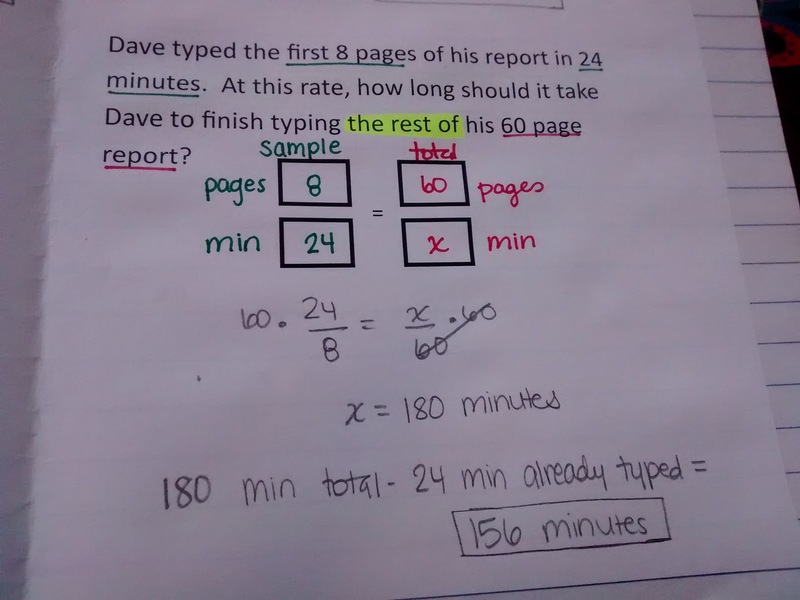 I intentionally wrote problems that were tricky in this way so that students would get extra practice with close reading. The questions they face on their end-of-instruction exam are going to be tricky, as well. If groups got stuck at any time, they had a stack of cups on their desk. One red cup, one yellow cup, and one green cup. I explain the cups to them in this way: If I see the green cup, I know your group is working well. I might stop by to eavesdrop, but I'll more than likely leave your group alone to do your thing. If I see a yellow cup, I know you have a question for me, but you feel like you can keep working until I can make it over to your group. If I see your group has a red cup, I know I need to drop everything and rush over to help because you are at a total stand still. Oh, and one last picture. Here's the answer checking station I set up in my classroom. I just propped up the cards on the tray of my dry erase coordinate plane board. These colorful cards immediately caught the eyes of many students when they walked in my room, and they couldn't wait to figure out what they were all about. 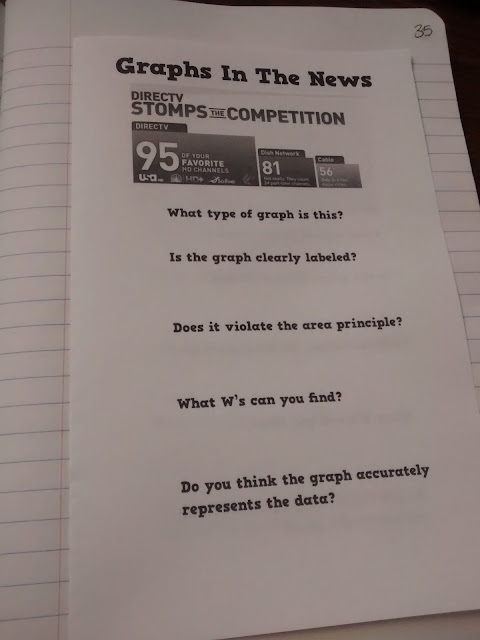 I made this practice problem insert for my statistics students to use to practice analyzing graphs of categorical data. I pulled some real-life data displays from the internet. 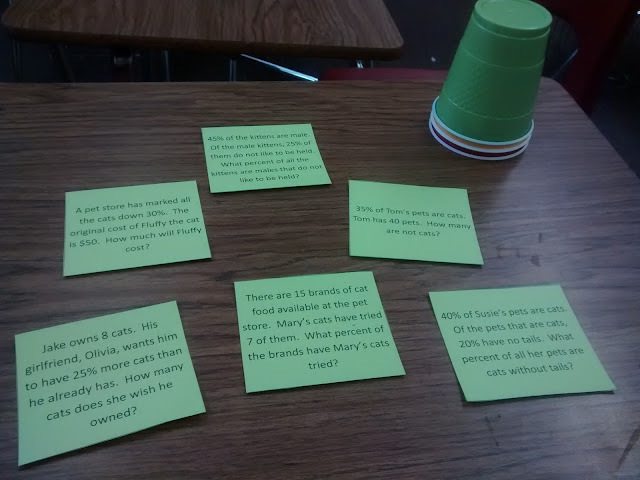 Then, I had students discuss these questions together as a group. I loved hearing the students reason through these! I took the question prompts from Stats: Modeling the World. 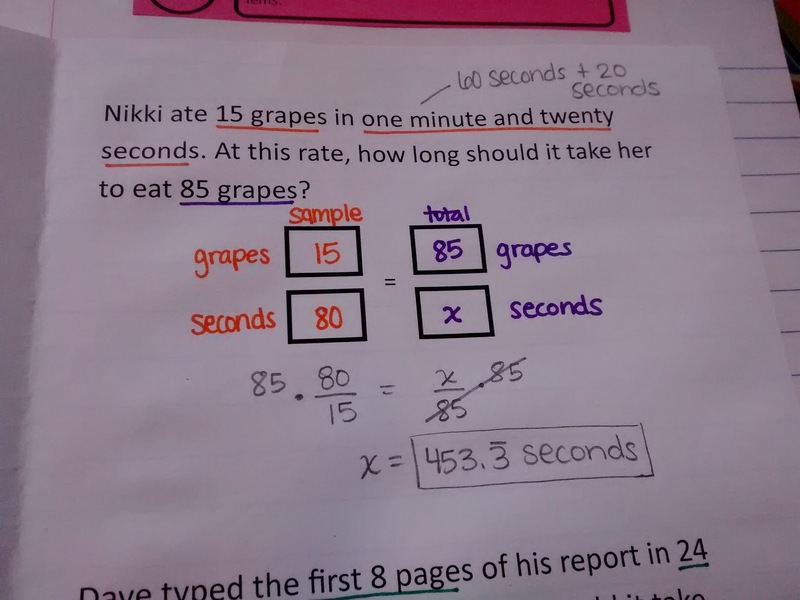 The original assignment was to find an example of each graph on their own and answer the questions. I decided to just go ahead and pick out some graphs for them to use. They thought it was cool to be able to find flaws in graphs created by real-life professionals. I've decided that the secret to having my students set up proportions correctly is to make them write the units on BOTH sides of the proportion. 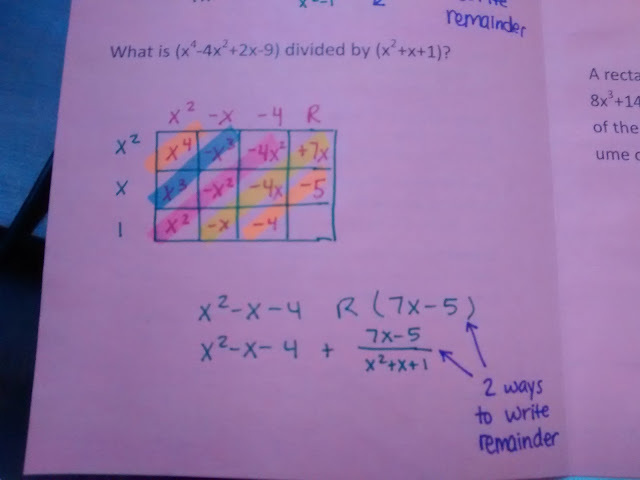 And, to get around cross multiplying, we just take the reciprocal of both sides anytime the variable we are solving for is in the denominator. Yay for nixing the tricks! 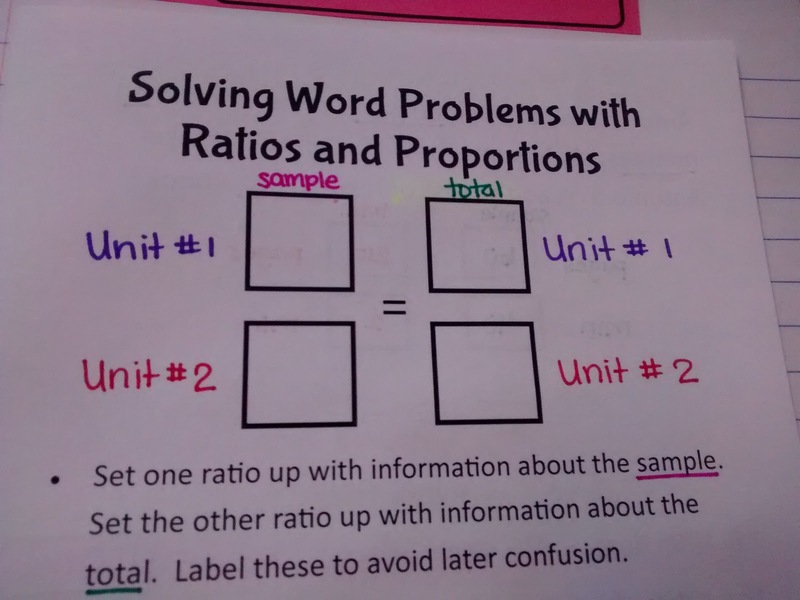 Here are the 4 practice problems we worked together in class. The problems are written to mirror the type of questions that may be asked on the end-of-instruction exam. 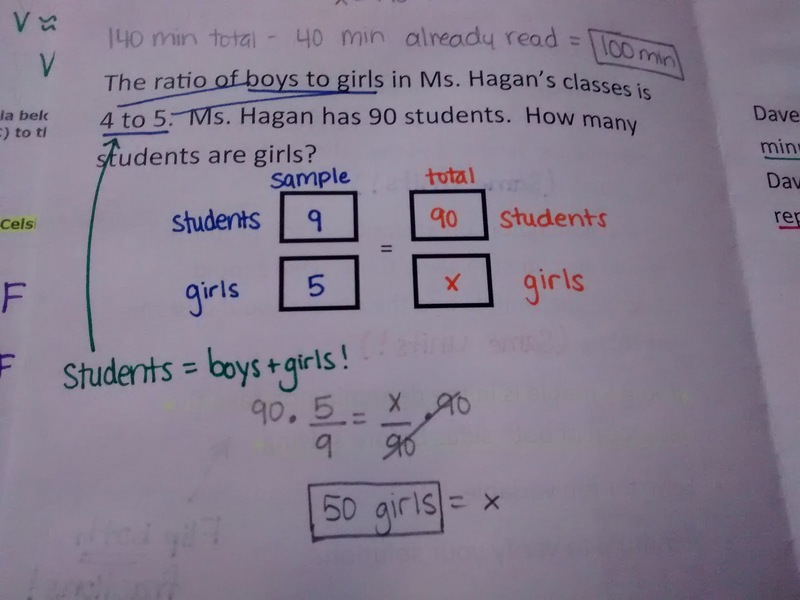 The past two years, I've kinda skipped over this because I believe students should have mastered this type of problem at the middle school level. But, our middle school math scores have been extremely low for the past several years. So, I can't assume that anything was retained from those classes. I know they've retained some things; I just can't be sure what those things are. 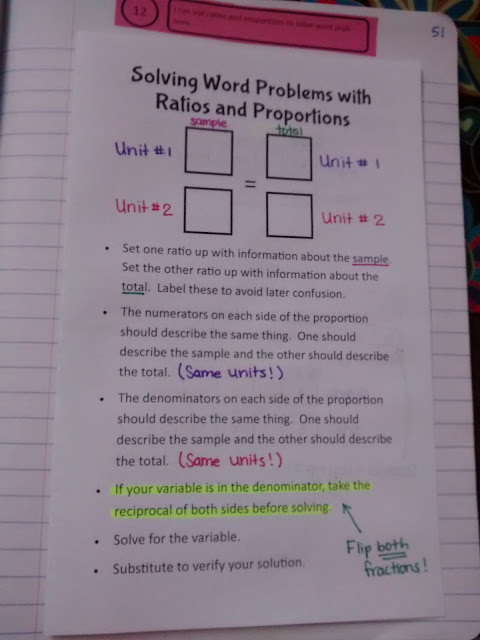 So, this should be largely review for my Algebra 1 students, but I hope it is also helping my students to become more comfortable with word problems which is one of my goals for this year. Here's a close-up of the four problems we worked. 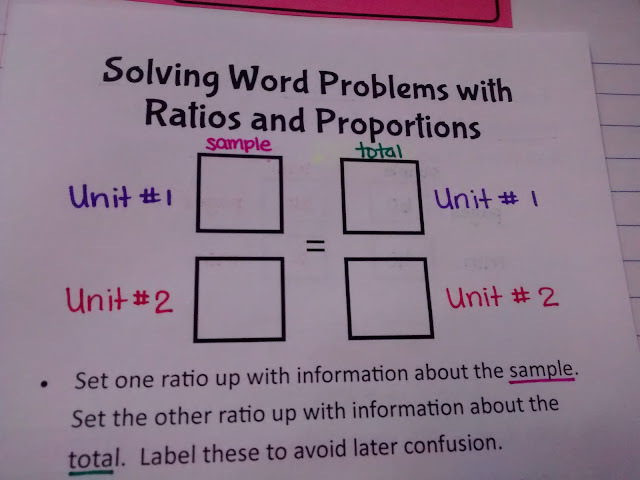 My students especially find these problems tricky where they give them the ratio of two types of something and then ask them to find the total number or give them the total number. On the SMART Board, we started out with 4 boys/5 girls. We put 90 students/x girls on the other side. This meant we had to change boys to students and add 4 boys to 5 girls to make students. 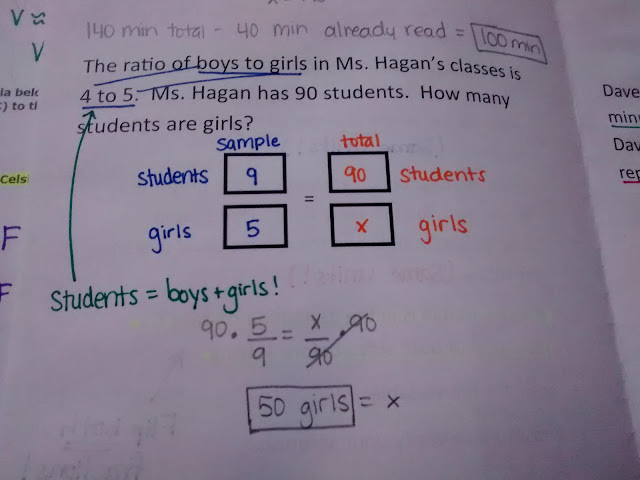 After working through this one, most of my students rocked the question like this on the quiz! In years past, it's always been one of the trickiest questions for students when we started reviewing for the end-of-instruction exam. Full disclosure: my students did terribly on this quiz. But, it was also the last day before Fall Break and a 5-day weekend. Nobody wanted to be there. When they came back from Fall Break, we worked through the quiz questions, I reiterated the importance of writing out ALL of our units, and the students requizzed the next day with much better results. In retrospect, I should have just spent Tuesday doing more practice problems instead of making them take the quiz that day. 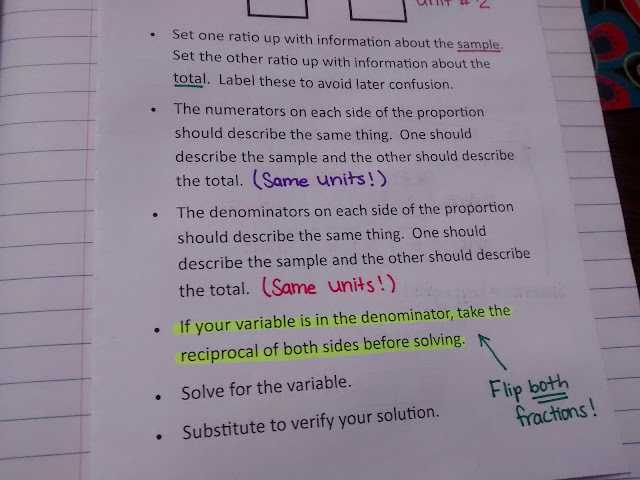 I had been hoping to wrap up ratios and proportions so we could move on to percents when we got back. Today, I want to talk about one of my favorite things in the world. 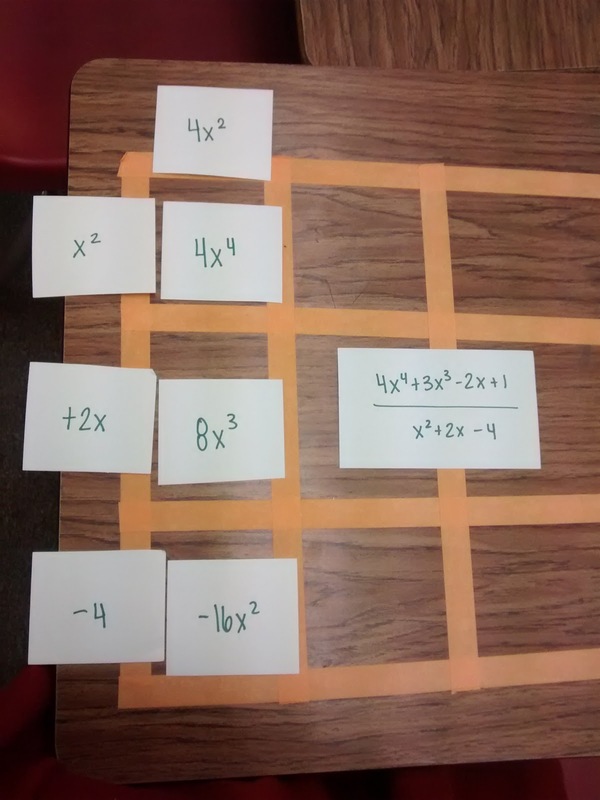 Dividing polynomials. I used to dread teaching this because it meant long division. 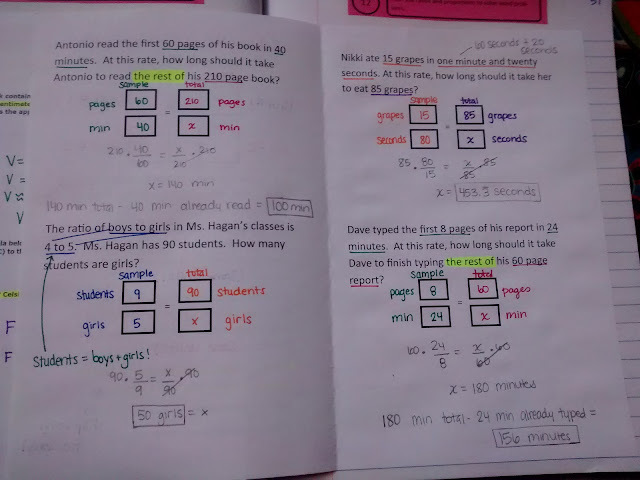 And, my kids couldn't even remember how to do regular long division. In high school, I learned to do synthetic division, but that only works if the polynomial you are dividing by meets certain requirements. Somewhere along the way, I was introduced to the box method. And, it seriously changed my life. 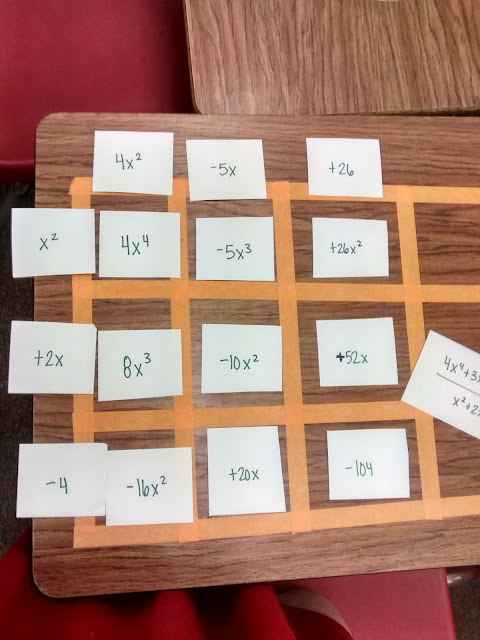 If you're not familiar with the box method, you should probably start with this post on multiplying polynomials. Here's the steps I wrote out for my students in case they forgot the process. They're not perfect. But, considering the fact that I didn't give my students any written out steps last year, they are a vast improvement over nothing. Feel free to tweak them and make them better! Then, we did four example problems together. The kids gave me grief for not printing this on white copy paper. Apparently peach paper and highlighting don't go well together. Note to self: use white paper next year! And, here's a close-up of each problem. 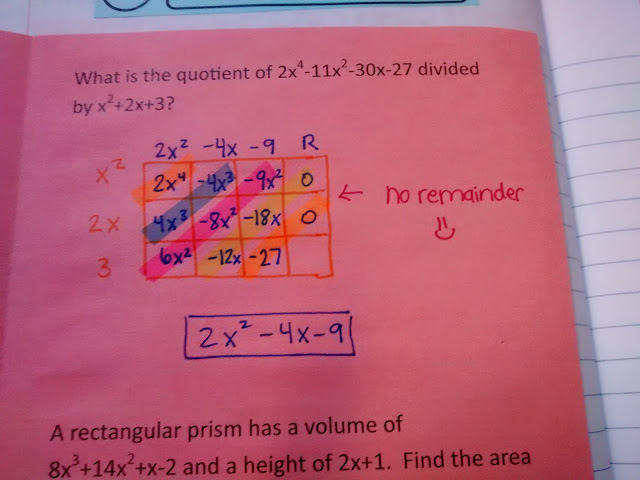 I made sure I gave them two problems with remainders and two without. See how I have them write an R in the space following the constant in the answer? This is a trick I learned from a student last year. She invented that strategy on her own. As soon as I saw it, I knew I was going to steal it and implement it the next year. I did, and I'm so glad I did! I also made sure I exposed to them to an "application" problem that they might see on their end-of-instruction exam. After doing 4 example problems together, I could tell that they were really frustrated. I tried explaining that this was the easy method. But, they didn't believe me. 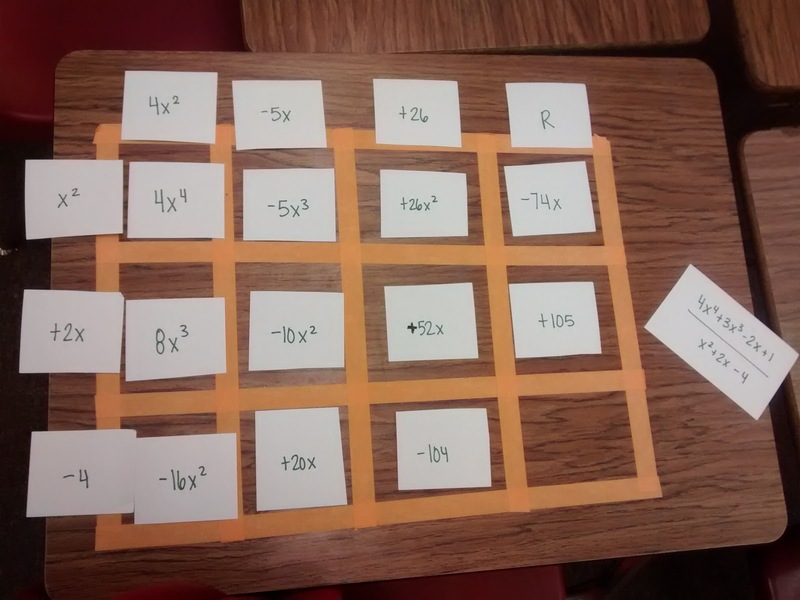 So, I decided to devise some dividing polynomial jigsaw puzzles for my students to put together. 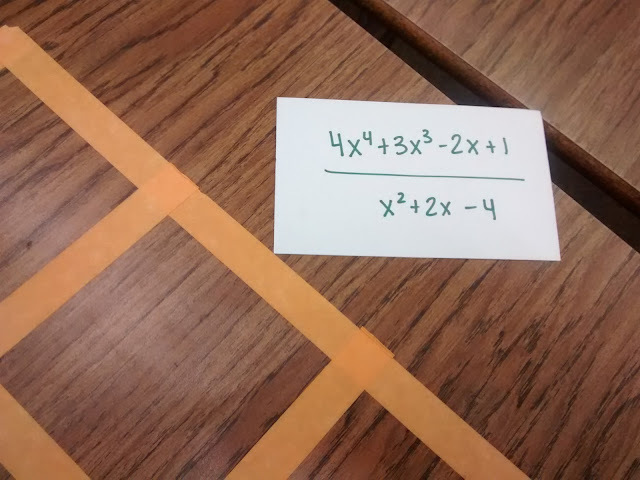 I took orange painter's tape and made boxes like this on four of the desks. Students were all abuzz with questions about what in the world was on the desks. My Algebra 1 kids were especially offended when I explained it was for my Algebra 2 classes. 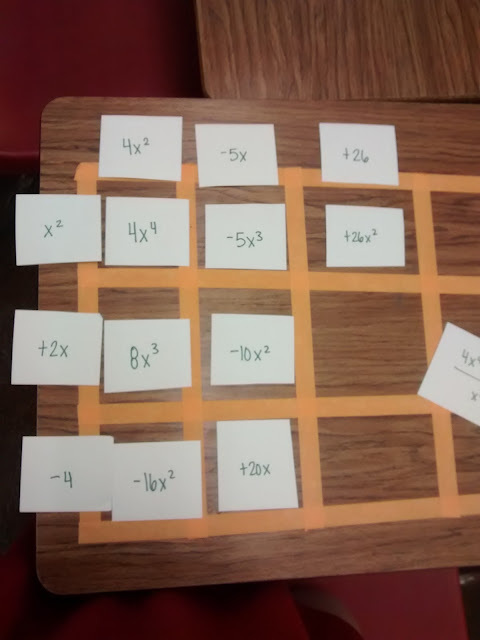 Several students claimed that they wanted to learn to divide polynomials so they could use it. My Stats students were a bit miffed, too, because I didn't do this for them last year when they were in Algebra 2. 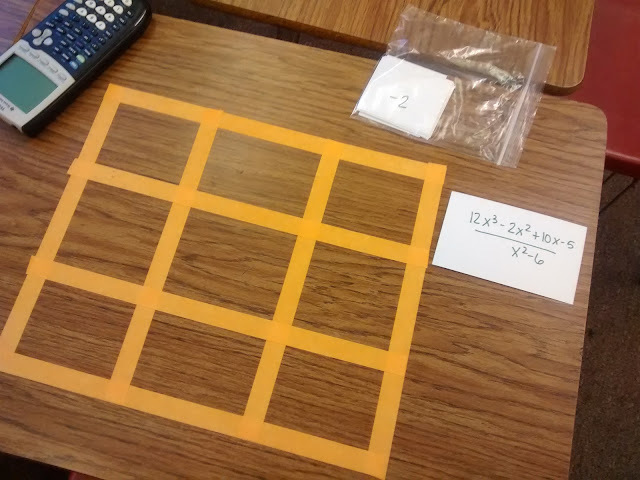 Each station had a pre-built box, a dividing polynomial problem, and the necessary pieces to fill out the box. 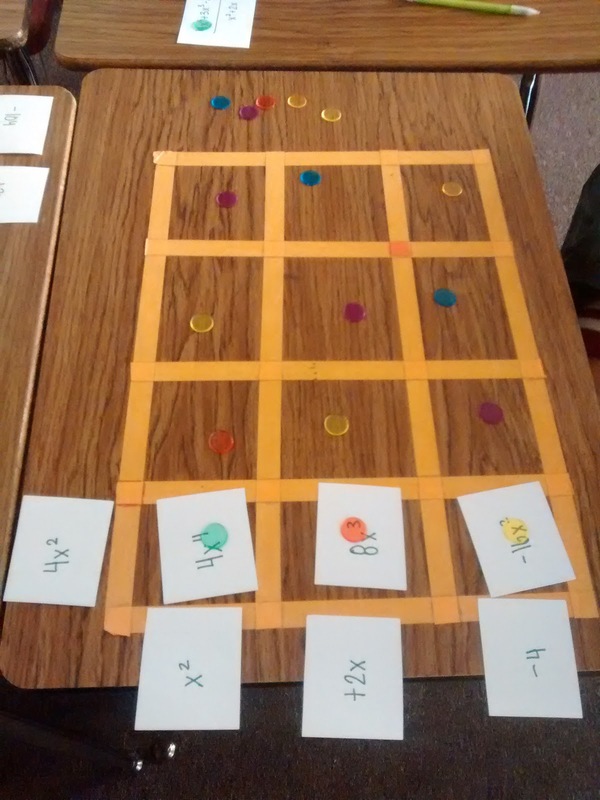 Students were placed in groups of 4. They had to circulate around each of the 4 stations in the room. Due to small class sizes, I only had 3 groups circulating around the 4 stations. At each station, only one person is allowed to touch the cards. 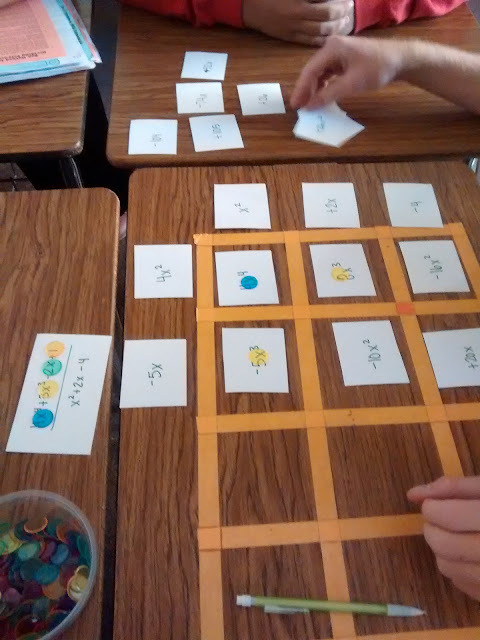 The rest of the students can coach and give assistance, but only one person gets to put the puzzle together. The person who puts the puzzle together changes at each station. So, everyone gets a chance to put one entire puzzle together. 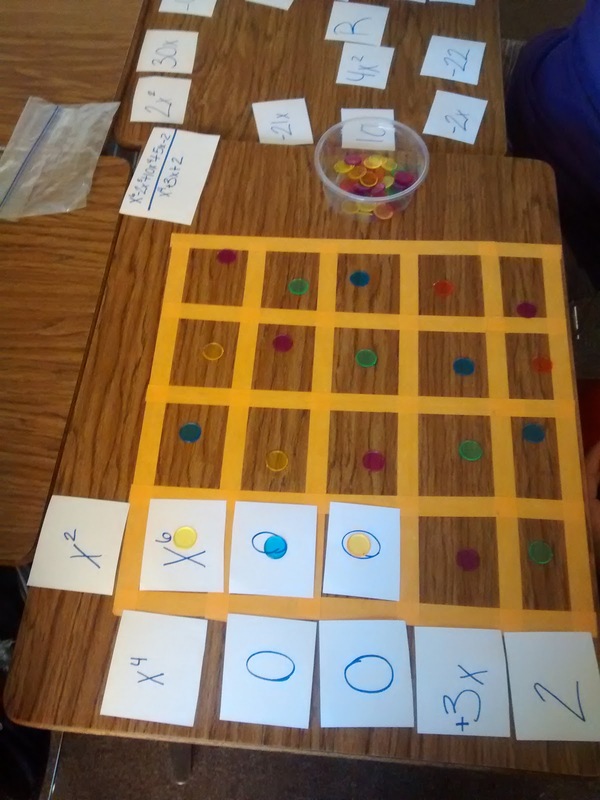 This was a good structure because kids knew that they would be in charge of putting the puzzle together one time which meant it was important to pay attention! 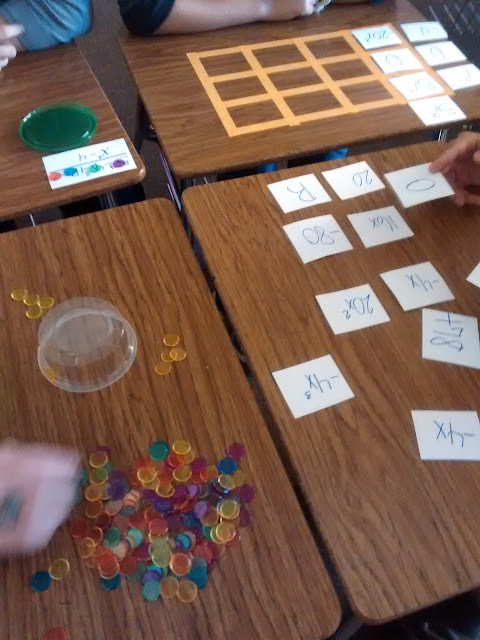 And, it also meant that kids had to do a lot of math talk because they weren't always allowed to touch the cards. If you're confused about how this works, you're in luck because I'm about to show you. Lay out all of your pieces. 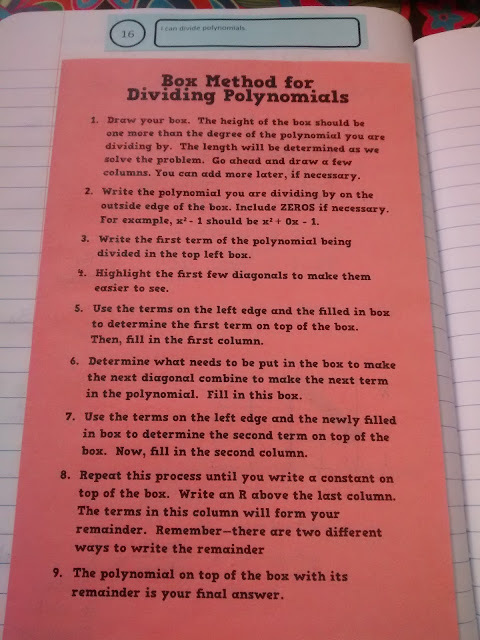 Take the polynomial you are dividing by and put it on the outside edge of the box. 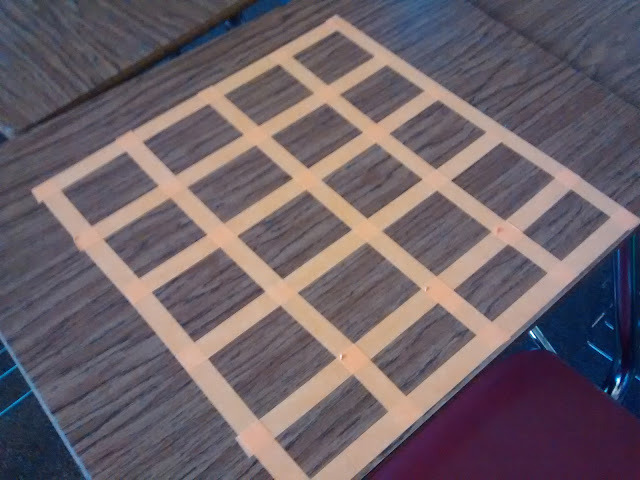 I didn't plan very well and put this grid too close to the edge of the desk. Some of my students realized that they could start building the box from the opposite side! 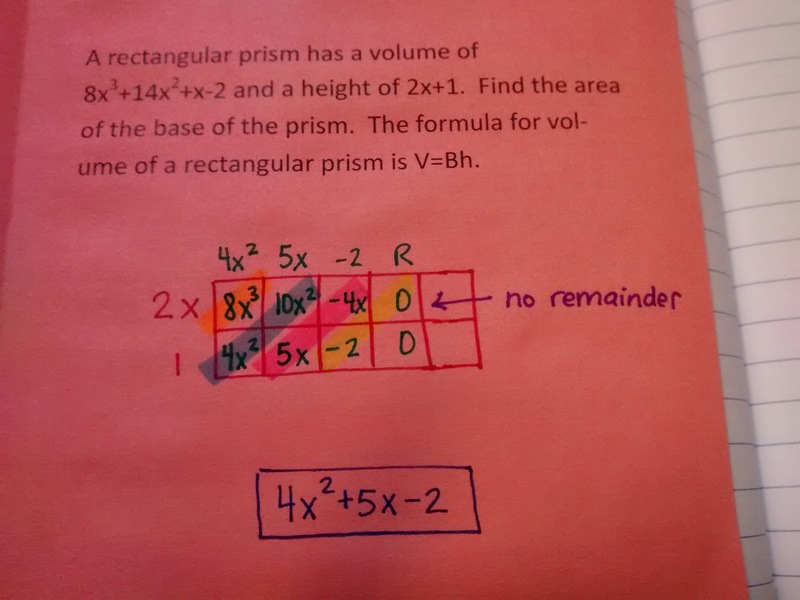 The first diagonal is made up of just the x^4 term of the term being divided. So, we can just go ahead and fill it in the box. Now, we have to ask ourselves x^2 times what equals 4x^4. 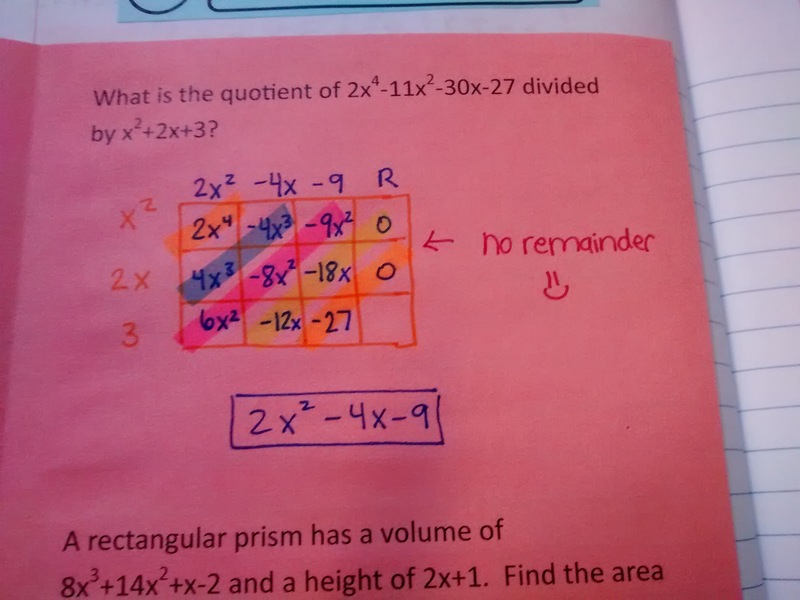 That answer goes on top of the box. Once 4x^2 is on top of the box, we can multiply 4x^2 by 2x and -4 to fill in the rest of that column. 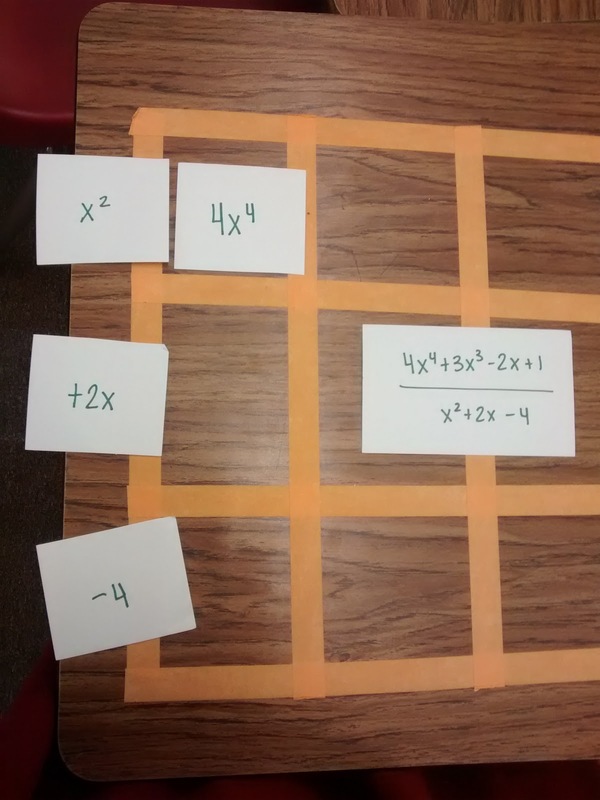 Now, we have our x^4 diagonal taken care of. Our next diagonal needs to sum to make 3x^3. We already have 8x^3. 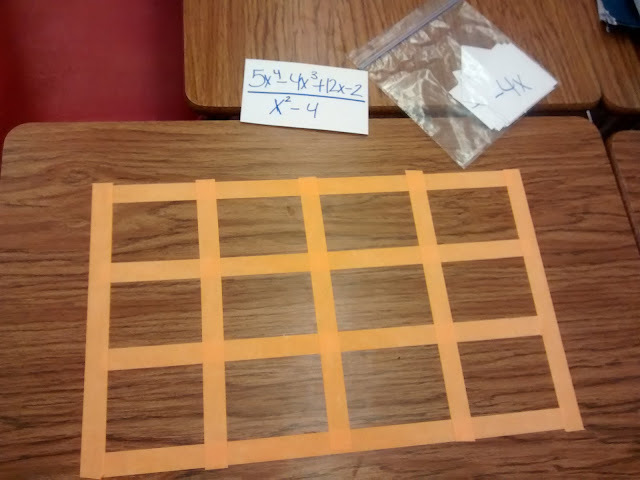 We need -5x^3 to complete the diagonal. 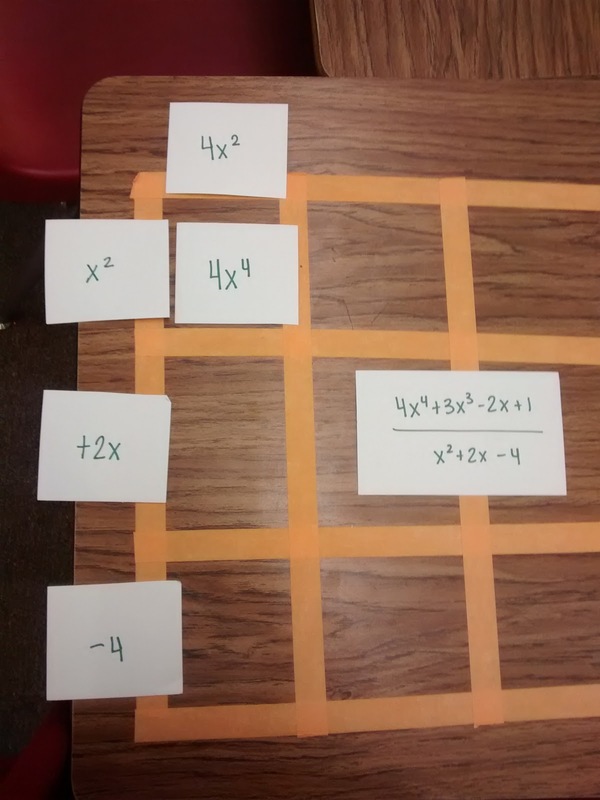 Then, we ask what x^2 needs to be multiplied by to be -5x^3. That answer goes on the top. 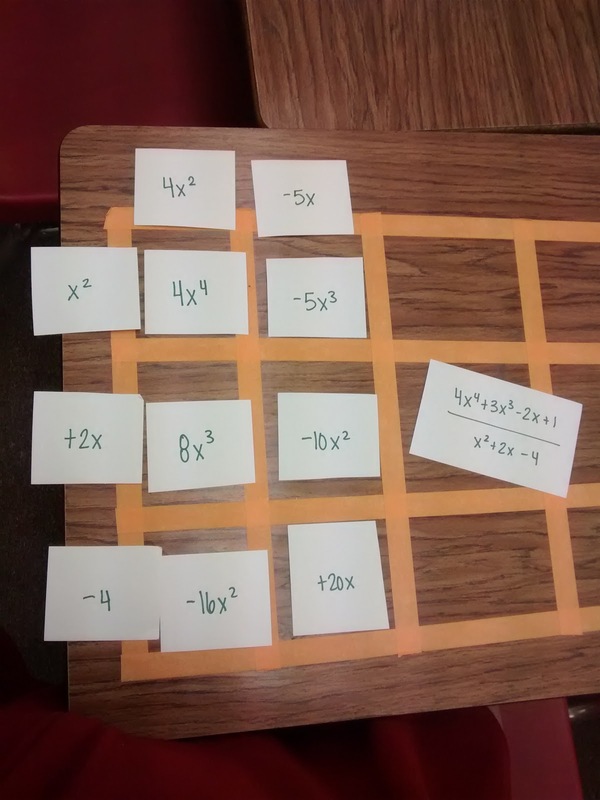 Having the term on top lets us fill in the rest of that column by multiplication. Now, it's time to make our third diagonal sum to 0x^2. This sometimes takes a while for students to get used to. -16x^2 and -10x^2 sum to -26x^2. So, we need a +26x^2 to finish out that diagonal. Getting the hang of this yet? We need to figure out what x^2 needs to be multiplied by to equal 26x^2. This goes on top. 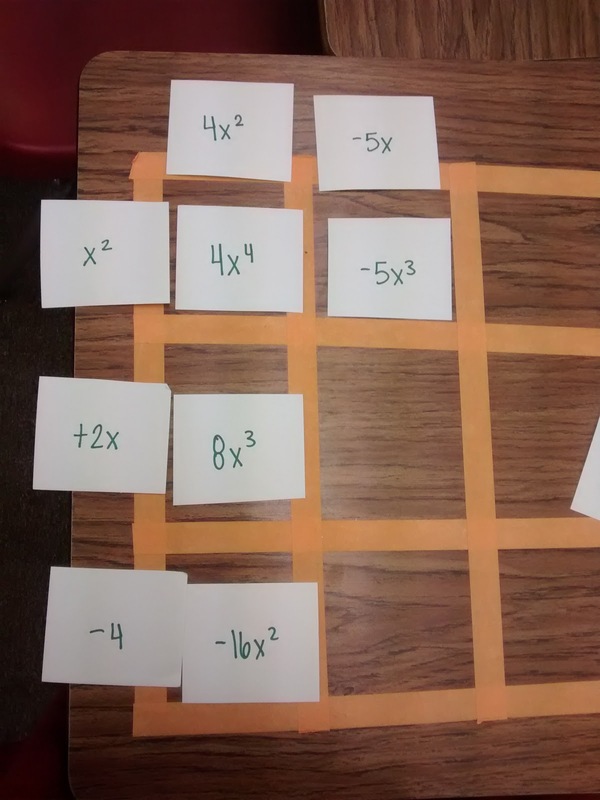 Once we figure that out, we can use multiplication to complete that column. Once you write a constant on top of the box, it is always followed by an R for remainder. The remainder gives us a chance to make sure the diagonals sum to exactly what we need them to sum to. Sometimes, they will already sum to the correct values which means you have no remainder. In this case, 20x and 52x needed a -74 x to sum to -2x. And, -104 needed +105 to sum to 1. And, we're done! 4x^2 - 5x + 26 R (-74x + 105) is our answer. Does it still take a long time to do? Yes. Does it make way more sense than long division or synthetic division? Yes. One of my students came in after school that day and asked if she could work on one of the puzzles. I said sure. 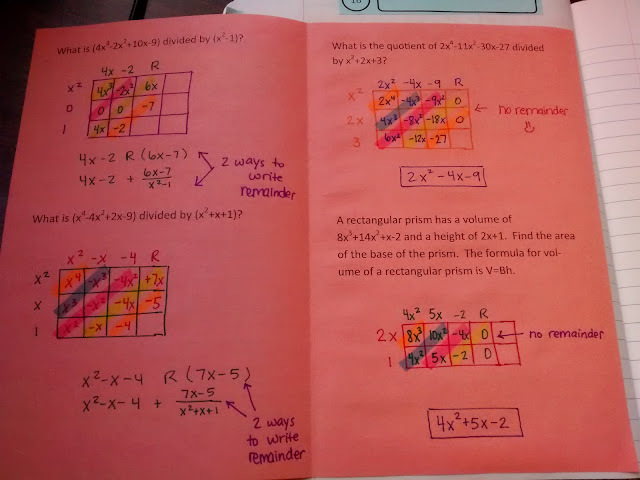 After she finished, she told me that if we had someway to color code the diagonals, it would really help her. So, we started brainstorming ways to do this. Our first idea was some sort of see through colored paper. But, I don't have any of that. Then, she said we could use bingo chips. 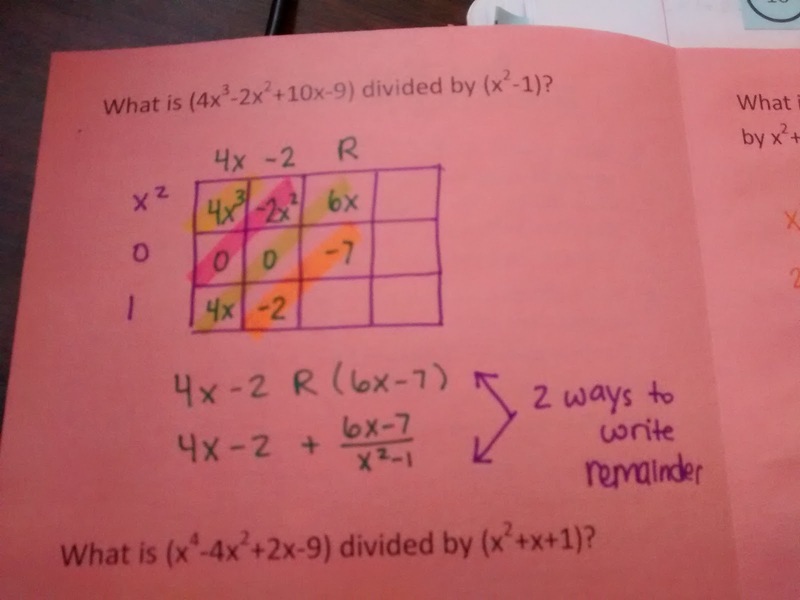 I tried this out with another class the next day, and it worked really well. 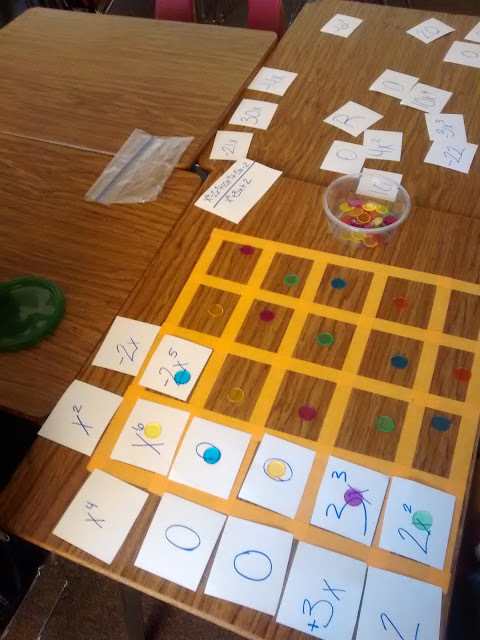 Here's some pictures of the bingo chips in action. Here's the group that decided to work from the right side instead of the left side. Start using these puzzles with multiplying polynomials. 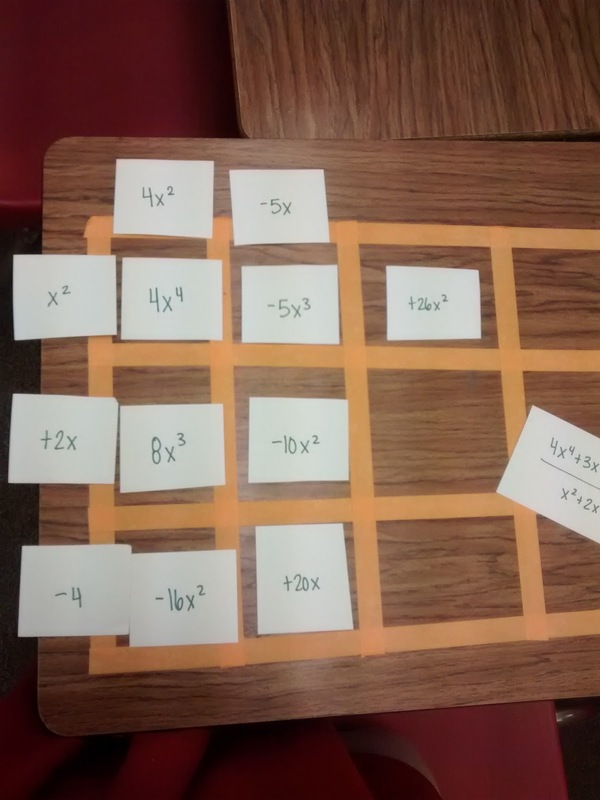 Then, I think they will need less explanation with dividing polynomials. Bingo chip color coding is awesome. 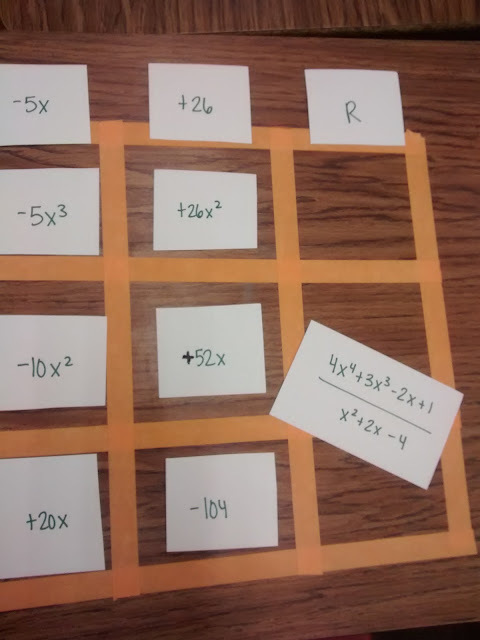 Next year - make extra cards that don't belong in the puzzle to challenge students who need it. Could differentiate in this way. Give them choices of each level - easy and hard. After completing the jigsaw puzzles, students were much more confident about dividing on their own. 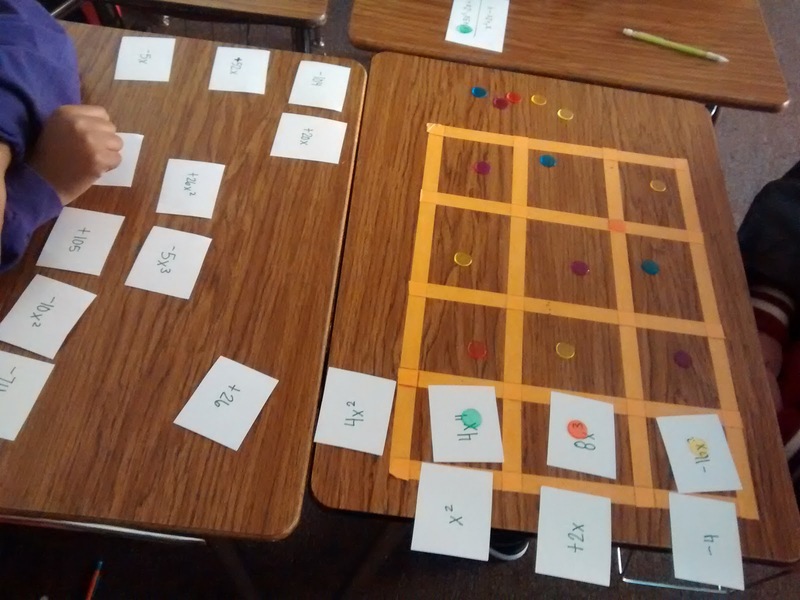 Still need to work on the best sequencing of when to introduce the puzzle. 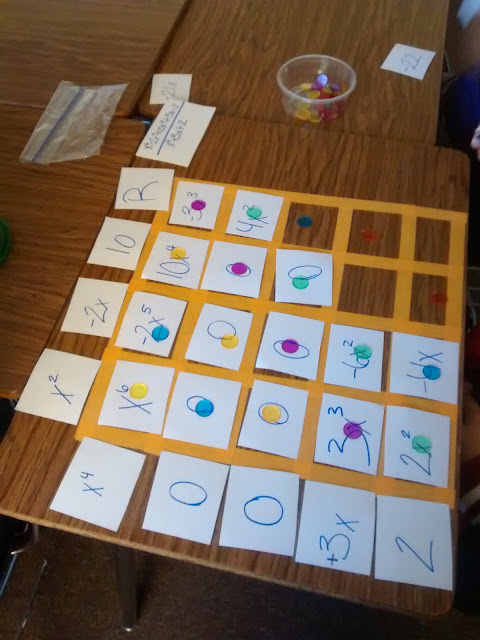 Also - the same student who suggested the bingo chips for color-coding diagonals suggested that I give them problems that were already worked out but contained an error for them to find and correct. I really like this idea! I told this student that she should definitely consider teaching as a career because she had a knack for this type of thing!